The Spanish way of life is uniquely theirs: they party late and still get up at a reasonable time to do a day's work. They eat big lunches that go on for hours and then sleep in the afternoon before they finish the workday. Travelers can get confused or disappointed with the results of this lifestyle if they don't know what to expect. There are a few simple rules to remember: eat late, go out late, and don't try to anything in the mid-afternoon. The unusual timing of the Spanish day is all part of the experience of getting to know the country. Below are two scenarios that are typical of tourists in Spain; the first hasn't done enough research and is expecting everything to be as it is at home, but the second has read up on life in Spain and has made plans based on that knowledge. Wrong: Arrive in the city, check in to your hotel, and head out for dinner. Right: Arrive in the city, check in to your hotel, and have a leisurely walk around town to get your bearings or have a small bite to eat, such as tortilla de patatas (omelet) or churros (strips of doughnut) with chocolate for merienda (snack). Wrong: Find an empty restaurant that is just opening up, eat in silence, and leave just as other customers start to come in. Right: Continue walking around town and perhaps check out an art gallery or museum. Things are still open, and you have all the time in the world before the restaurants start hopping. Wrong: Go back to your hotel, shower, and get ready to see the nightlife. Ask where the best nightlife is, but arrive at the bars and find them all empty. Right: Head out for dinner. Around 9 p.m. is the perfect time to find a restaurant starting to fill up. 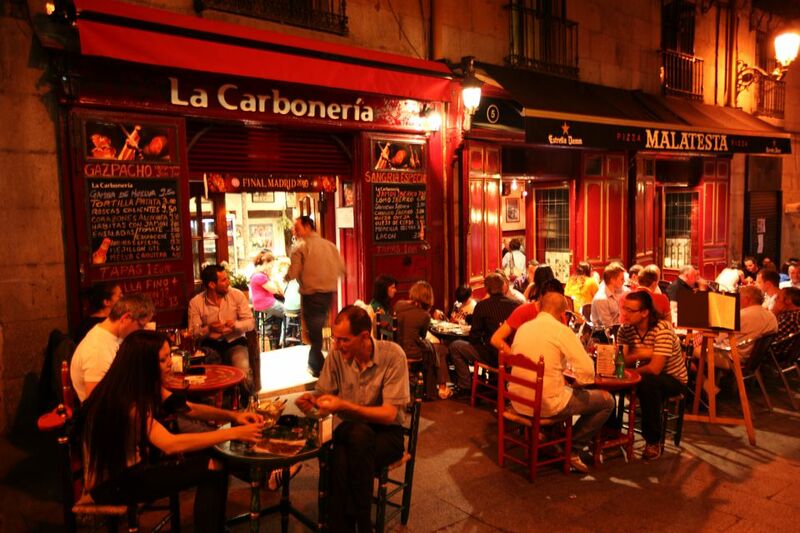 This is when the Spanish eat dinner, and it lets you fit right in with the Spanish way of life. Wrong: Having exhausted all the bars in the city center and found them all empty, you eventually find a bar with some people in it. You have a couple of drinks and go back to the hotel before midnight. Right: Ask where to find the best nightlife, and head out at about 11.30 p.m. That's when the Spanish club and bar scene gets going. You’ll find all the bars full of people. Move from bar to bar, and enjoy the scene. Wrong: You go down to the hotel bar, and pay far too much to drink a bad brand of scotch that no Scotsman likely will have heard of. You eventually head to bed. Right: Are you still going strong? Good. There will be bars open as long as you can stay awake. Different regions have different laws on drinking times, but most bars will be open until 3 a.m., especially on the weekends. Right: This is when the bars close. Congratulations on making it this far. If your batteries still have some power in them, go on to a nightclub, which will be open until 6 or 7 a.m. But don’t forget to sleep sometime. Wrong: Sleep in and wake up regretting those scotches in the hotel bar. Get up and spend an hour looking for a hearty breakfast like you get back home. Right: Get up, even if you were up late the night before (you'll have a chance for sleep later). Get something light for breakfast, such as coffee and some churros, which is a typical Spanish breakfast. You ate late the night before, so you shouldn’t be too hungry. Then head out to see the sights. Wrong: You fail in finding a hearty breakfast like the kind you get back home. You settle for something you didn't really want and then finally set out to see the sights. Right: You should be out enjoying the sights by now. Wrong: After having spent the last few hours in a big museum, such as the Prada in Madrid or the Picasso Museum in Barcelona, head out to find lunch at about 2:30 p.m. You find that everything is closed for siesta. Shops such as drugstores are closed, too. Right: Eat a big lunch, Spanish style, at 1 p.m. Take your time since this is when the Spanish have their main meal of the day. Wrong: You fail in finding anywhere nice to eat lunch and end up at McDonald’s since it’s the only thing open. You decide to go to an art gallery, but guess what? It's closed. Right: Head back to the hotel for a while and take a nap, which you'll really need since you were up late and did not sleep late in the morning. It’s siesta time, so everything is closed, and the heat will be unbearable anyway if it's summer. But don’t sleep for too long. Spanish scientists say 30 minutes is ideal for a siesta; any more and you’ll wake up feeling worse.